Your life is your biggest project. Design it. Pamela Sisson, Designer, art director and writer in New York. Design has a profound influence on our daily lives. One cannot deny the importance it plays in our experience of the world. Yet, we rarely think about how the principles of design are best applied in our own lives. The effects of design are largely unconscious or subconscious. However, our ability to think consciously is the greatest gift we have. Without deliberate thought regarding the nature of being, you’re relegated to living a life the world has defined for you. The universal design principles outlined below can also be applied in your own life and may prove invaluable towards creating an existence you truly desire. Not just for now, but for the long-term. 1. ENTRY POINT: A point of physical or attentional entry into a design. “Be Inviting And Approachable” Creating an inviting “entry point” is important in any type of design discipline, but especially in situations where attention spans are low and the the first moments of an interaction can make or break it. Similarly, when a person first encounters another person, the initial impression greatly influences subsequent perceptions and attitudes, which then affects the quality of subsequent interactions. Mind your body language, capitalize on aspects of attractiveness and smile. People do judge a book by it’s cover! 2. CONSTRAINT: A method of limiting the actions that can be performed on a system. “Use Roadblocks to Drive Creativity” Self-imposed constraints can spark new ideas and innovation. Obeying constraints puts you in control. It forces you to think creatively by closing mental motorways and allows you to perform at a higher level by putting your focus squarely on the right things. Behave as a beginner to uncover the exact ingredients required to spark creative magic. You already have everything it takes to flip constraints into advantages. 3. EXPOSURE EFFECT: Repeated exposure to stimuli for which people have neutral feelings will increase the likeability of the stimuli. “Keep Showing Up” The more often people are exposed to something the more they tend to like it, whether it’s sound, art or people. In studies of interpersonal attraction, the more often a person is seen by someone, the more pleasing and likeable that person appears to be. Use the exposure effect to build your social network, improve your social life and improve your relationships. 4. WEAKEST LINK: The use of a weak element that will fail in order to protect other elements in the system from damage. “Face Your Shadows” We all have areas of opportunity. Discovering your weakness before your opponent does is common reasoning in martial arts training. Don’t just fixate on your strengths. Being complacent with your skills will crush your potential to be greater. Instead of feeling insecure about weaknesses, target those problem areas and find ways to improve. You may not transform overnight, but you will feel much better making any kind of progress. 5. FIVE HAT RACKS: There are five ways to organize information: location, alphabet, time, category, or hierarchy. “Transform Information Into Knowledge” The way we organize ourselves has a profound effect on the structure of our lives. Most people feel overwhelmed with facts and data masquerading as useful information. The idea is that there are five ways to organize all information. Use these 5 “hats” to sort personally relevant information to plan your life, solve problems, and start engaging the world and people around you in a more meaningful way. Further reading: “Information Anxiety” by Richard Saul Wurman. 6. HIERARCHY OF NEEDS: In order for a design to be successful, it must meet people’s basic needs before it can attempt to satisfy higher-level needs. “Satisfy the Basics” The hierarchy of needs specifies that a design must address lower-level needs before higher-level needs can be addressed. The levels of hierarchy are adapted from Maslow’s Hierarchy of Needs. Healthy human beings have a certain number of needs, and these needs are arranged in a hierarchy, with some needs (such as physiological and safety needs) being more primitive or basic than others (such as social and ego needs). Every person is capable and has the desire to move up the hierarchy towards a level of self-actualization. The question of capability or potential isn’t about someone else. Know thyself! Further reading: “A Theory of Human Motivation” by Abraham H. Maslow. 7. PROPOSITIONAL DENSITY: The relationship between the elements of a design and the meaning they convey. Designs with high propositional density are more interesting and memorable than designs with low propositional density. “Be Interesting and Meaningful” Propositional density is an important design consideration and one that adds interest, engagement and memorability. Consider propositional density in all aspects of life. In other words, don’t be boring! For example, double entendres and puns are amusing because they convey multiple possible interpretations and meanings. The more connected and layered your idea is, the more strongly it will resonate with others; making it more likely to be “top of mind”. 8. STORYTELLING: A method of creating imagery, emotions, and understanding of events through an interaction between a storyteller and an audience. 9: NOT INVENTED HERE: A bias against ideas and innovations that originate elsewhere. “Don’t Reinvent the Wheel” Be willing to embrace new ideas and innovation, regardless of the source. Most attitudes are based upon experiences and habits that have served us in the past. But in order to cope with challenges in the 21st century, an open and adaptive mindset is absolutely necessary. Find innovations wherever they can be found — whether its new leadership, procedures, processes or technology — and do your best to incorporate. This is how the greatest innovators get and stay on top. 10: SIGNAL TO NOISE RATIO: The ratio of relevant to irrelevant information in a display. The highest possible signal-to-noise ratio is desirable in design. “Be Clear and Precise” The principle itself is applicable to design and communication problems in virtually any field. All communication involves the creation, transmission, and reception of information. Communicate truthfully and clearly with as little degradation to your message as possible. Express yourself to the extent necessary, but not beyond the extent necessary. Excess is noise! 11: VON RESTORFF EFFECT: A phenomenon of memory in which noticeably different things are more likely to be recalled than common things. “Be Distinguished” We live in the ‘attention age’ when everyone and everything around us is constantly battling for a moment of our time. We battle with each other to stand out from the crowd and be remembered by the audience. When multiple similar choices or items are present, the one that differs from the rest is most likely to be remembered. Aim high and stand out. 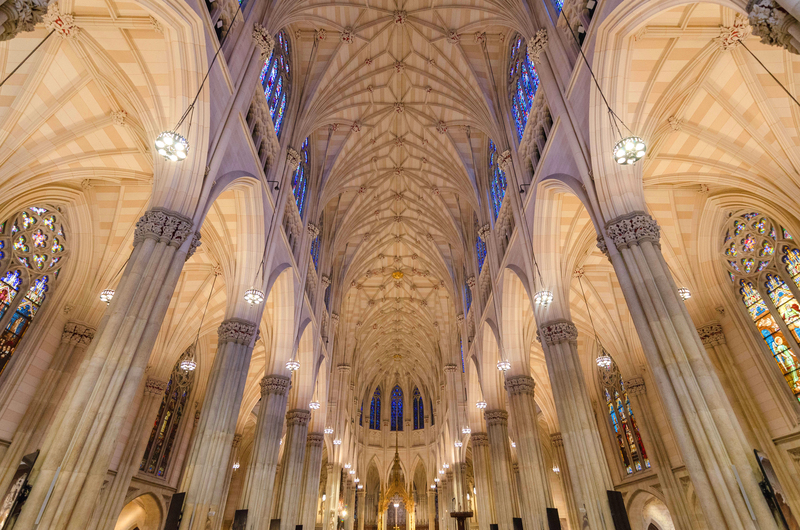 12: CATHEDRAL EFFECT: A relationship between the perceived height of a ceiling and cognition. High ceilings promote abstract thinking and creativity. Low ceilings promote concrete and detail-oriented thinking. “Frame Your Mind” High ceilings tend to have a cognitive effect of opening up creative and big-picture thinking whereas lower ceilings have the effect of more detail oriented thinking. Awe-inspiring cathedrals are reminiscent of the openness of the cosmos, whereas chapels, which are small and contained, are likely to convey the notion of confinement. This is important to consider in the design of your work and living environments, as this affects the manner in which you process information. Inspired by “Universal Principles of Design” by William Lidwell, Kritina Holden and Jill Butler and “12 Rules for Life: An Antidote to Chaos” by Jordan B. Peterson. Pamela Sisson is a graphic designer with more than 15 years of experience. She's also a freelance photographer, writer and the founder of Reinvent, a New York-based brand and creative studio.